While many Americans concern themselves with the blatant disregard for the U.S. Constitution demonstrated by liberal Democrats in attempting to ram healthcare reform legislation through Congress, the news from Rome is even more shocking! 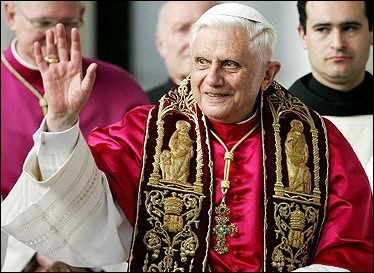 In the most sweeping changes to Roman Catholic worship since The Second Ecumenical Council of the Vatican (more commonly known as Vatican II), Pope Benedict XVI – only the eighth person of German heritage to ascend to the Chair of Saint Peter – in an effort to bolster attendance at Mass has dictated the replacement of wine and bread with beer and pretzels as the Communion offerings. 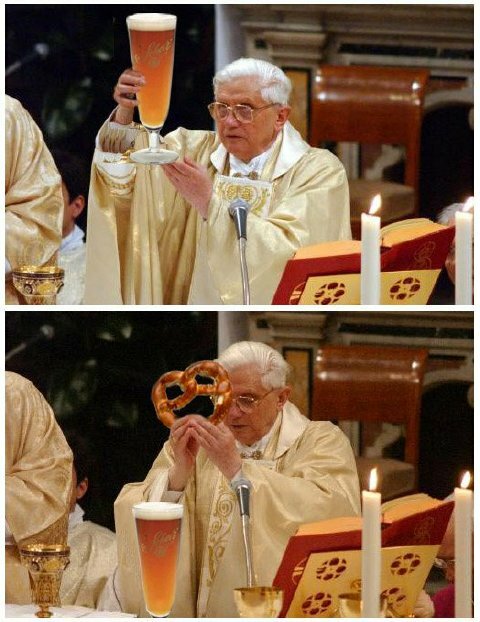 In pictures secretly transmitted to Write On New Jersey by a source at the Vatican, the Pope demonstrates the consecration of the beer and pretzels to assembled clergy. That is sooo sad to be blaspheming the holy sacrifice of the mass>:( We live in a sick world now. This is a sad attempt at humor. No other instance is as important to humans as the body and blood of Christ.